Just what are Human Rights? On December 10th, 1948, the international community, appalled by “barbarous acts which have outraged the conscience of mankind” they’d seen in World War II, vowed such atrocities would never happen again. 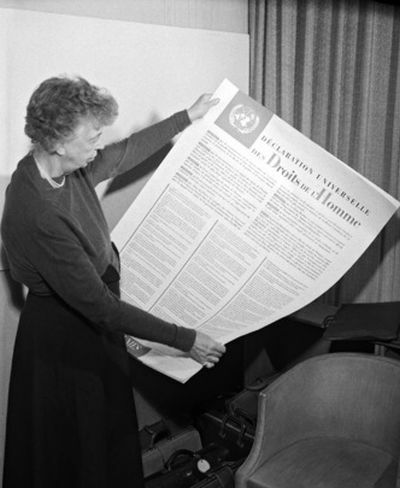 They signed the Universal Declaration of Human Rights. It was designed to bolster the United Nations Charter (1945) with guidelines to guarantee the rights of individuals everywhere. Were we to try to fit this document into a nutshell, we could select Article 3. “Everyone has the right to life, liberty and security of person.” The other 29 articles spell out more details of what violations look like, mention standard of living, education, even culture and specify that ‘everyone’ means everyone. In the 66 years since the declaration, dozens of international treaties, conventions and covenants have been signed and enacted. In signing these international treaties, national governments commit to respect, protect and fulfil human rights. The deal is that they must not interfere with or curtail these rights, they must protect people against human rights abuses and they must take action to facilitate basic human rights. These provisions are to be enshrined in domestic legislation. Should that fail, there are processes to take it to the international level. Yet with frightening regularity, we hear regimes accused of human rights violations. Just last week, leaders of world religions gathered at the Vatican to declare the intention to eradicate slavery. The international news is filled with stories of rigged elections, limitation of free speech, abuses by security forces, arrests without trial, people tortured or disappearing. Around the world – and even in our own country – many women, especially, enjoy neither freedom nor security. Closer to home, people of all sorts experience discrimination and intolerance. Notice the rights you enjoy. What do those rights mean to you? What would life be like without them? Which of your rights do you value the most? Where is someone fighting for that right? Where can you learn more about who is helping and how? Every day can be Human Rights Day.